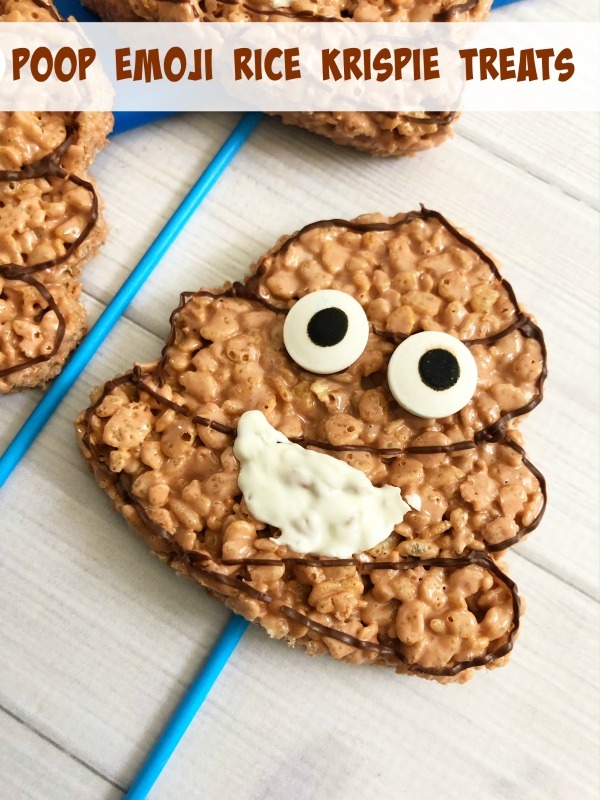 Poop Emoji Rice Krispie Treats are a fun & easy snack idea! 1. Grease a 9 x 13″ pan with butter or a non stick cooking spray. 2. In a large microwave safe bowl, combine your marshmallows and butter and heat for 1-2 minutes in the microwave or until the marshmallows get puffy. 3. Mix in several drops of brown food color bag and stir your marshmallows and butter mixture until mixed together. 4. Add your Rice Krispies cereal to the mixing bowl and stir until the cereal is evenly coated with brown melted marshmallows. 5. Scoop into your greased pan, press down firmly and let set for an hour to cool or transfer to the freezer for 30 minutes. 6. Press your poop cookie cutter firmly onto the Rice Krispies to cut out your poop shapes and place onto a sheet of parchment paper. 7. In two small separate microwave safe bowls, heat your candy melts on 50% power in the microwave for 3 to 4 minutes, stirring every 30 seconds until melted. 8. Fill one decorating bag with white candy melts and one with brown and cut a small tip off the ends of the bags. 9. Use your brown decorating bag to draw an outline on to each rice crispy treat and three diagonal lines from left to right with the bottom one starting in the center like pictured. 10. Dab a small amount of melted brown chocolate onto the back of two candy eyes and press carefully onto the center of the poop emoji‘s. 11. Use your white decorating bag to draw a half oval for the smile below the eyes. 12. Let your melted chocolate harden and enjoy! Obsessed with the poop emoji? 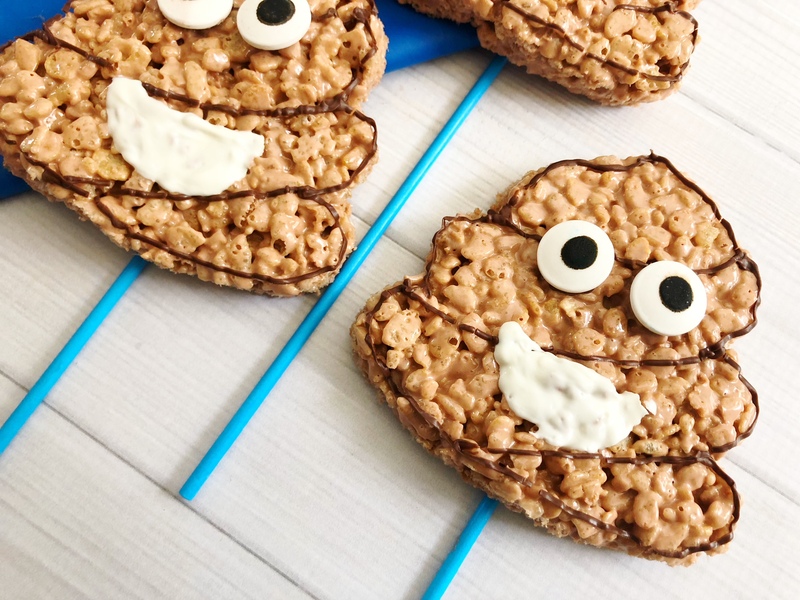 These Poop Emoji Rice Krispie Treats are a fun & easy snack idea! Everyone enjoy rice krispie treats and since they are easy to make a hit with me. I would have to get the cookie cutter to make these. They wouldn’t last long in my house. These are super cute and I imagine that kids will love them! Rice Krispie treats are always a hit. Both my husband and my son would love these Snacks and would enjoy helping make them. Although I could see them fighting over who gets each one so we might need to make a double batch or triple batch so the children in the neighborhood could have some of the treats. My kids will certainly enjoy making these and eating them up. Thanks for sharing the recipe! Girl…. 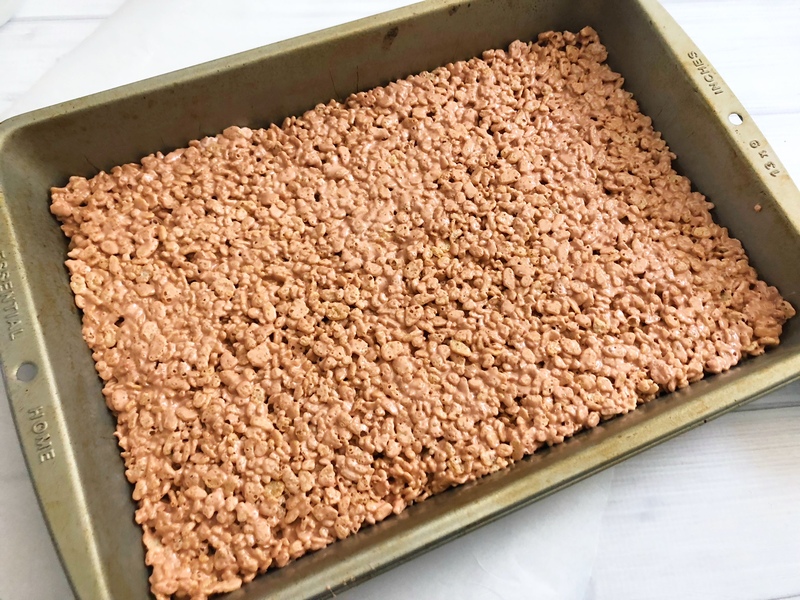 you have to make these with Cocoa Krispies! What????? Haha I never thought that its a poop emoji, I find it cute and doesn’t seem to think what the design is. I guess, making there would be really a nice idea. I detest the poop emoji…says the mom who bought the 5 foot poop emoji pool float for her daughter. lol. It’s just everywhere. However, these would be a total hit at a party! My girls would flip over these treats! They love rice krispie treats and they love poop emojis! I totally need to make this over the summer with them. I’m amused. My kids will be too. We’ll have to make this over summer break for sure. I love rice krispie treats. This is so funny to find today, the first thing I pulled out of my box of swag from Suite Sweet was a poop emoji toy! I haven’t had a chance to work on my recap of the biggest night of play or an unboxing but I will have to make these as inspiration when I write my post! My nephews are going to love these Rice Krispie treats! These are so funny and so wrong! Ha ha! I love Cocoa Krispies and Rice Krispies Treats are super yummy! Oh my goodness those are amazing! What a fun idea haha! Totally going to have to make some myself. Those turned out super cute. But really, what is it with boys and poop? The jokes, the stories, I’m over the poop. Oh my lanta! These are the cutest ever. I love that poop emoji. I think its a riot and I know my kids would LOVE these. Omg-these are absolutely adorable!! My kids would go nuts for these! Oh, those are so cute, Robin! I bet they would be a hit at any little boy’s (or big guy, for that matter) birthday party. These are the cutest treats ever! My kiddies would flip over these! My son’s birthday is coming up soon, and these will be on the table. In fact, you may have just made the party! Stop it right now! This is the best thing I’ve ever seen. My kids will LOSE THEIR MINDS if I make these! This looks like so much fun to make and yummy to eat. I know the kiddos would have so much fun making this. That’s the most appealing poop I’ve ever seen lol. When I was pregnant with my second one, I love love rice krispies! These turned out so cute and accurate! My kids would get a big kick out of these. Rice krispie treats are so fun (and delicious) to work with! Excited to try this emoji one!